Ahhh! Nothing says murder like.....Christmas? A month or so ago I started scrounging around online for different Christmas-focused reading suggestions. 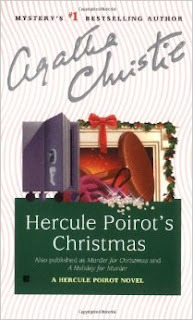 One of the titles which popped up was Hercule Poirot's Christmas by Agatha Christie. I haven't read anything by Christie in eons and December demands cozy reads. I don't know why murder mysteries fall into the "cozy reads" category but somehow or another, they do. I shall not overthink that. I found a copy of Hercule Poirot's Christmas and snatched it up, anxious to get at it. Last weekend I found myself with plenty of time and some attention to give so I settled into this story. It should be noted that this book was published under two additional titles: Murder for Christmas and A Holiday for Murder so if you think you have not yet read this title, double check before picking it up. In this story, a cranky multi-millionaire by the name of Stanley Lee unexpectedly and mysteriously invites all of his children home for Christmas. This is remarkable because he is estranged from many of his children and the majority of the family members dislike one another. Yet for one reason or another they all make the decision to come home for Christmas in hopes that they will have a moderately good time. Things don't go exactly as planned though, primarily because Mr. Lee has had such fun provoking his children to wrath that no decent relationship can possible exist. You can see his murder coming from the get-go. In Christie-like fashion it's just a matter of determining which relation did the old man in. Hercule Poirot is brought in to solve the case and it is no surprise that, eventually, he sorts out all of the clues and successfully names the murderer. If you're looking for something different this Christmas season and you like a good mystery, this one is perfectly themed (aside from being somewhat macabre). It sounds so weird to say that a murder mystery makes for a great Christmas read, but Agatha Christie is such a good mystery writer that I can't help but confess to enjoying it. Make of me what you will. I'll have to abide by your impression in this case. My family listened to the audiobook during our Christmas road trip last year. Perhaps not my favorite Christie, but it was entertaining.